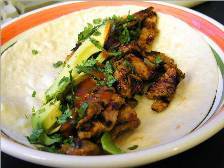 Exceptional Carne Asada recipe is a wonderful and easy to make summertime treat. Lay the flank steak in a large baking dish and pour the marinade over it. Seal the container and refrigerate for 1 hour or up to 8 hours. Don't marinate the steak for more than 8 hours or the fibers will break down too much making the meat mushy. Preheat an outdoor grill or broiler to medium high heat. Brush the grates with a little oil to prevent the meat from sticking. Remove the steak from the marinade and season the steak on both sides with Jake's Seasoned Salt and pepper. Grill (or broil) the steak for 7 to 10 minutes per side, turning once, until medium. Remove the steak to a cutting board and let it rest for 5 minutes to allow the juices to settle. Thinly slice the steak across the grain on a diagonal. To make tacos, stack up 2 of the warm tortillas, place about 4 ounces of grilled beef down the center, and sprinkle with some lettuce, onion, and cheese. Top each taco with a spoonful of the Pico de Gallo salsa and garnish with lime wedges and sprinkle on some additional Jake's Seasoned Salt. Repeat with the remaining tortillas. In a ceramic dish, bowl or mortar and pestle, or blender mash together the garlic, jalapeno, cilantro, salt, and pepper to make a paste. Put the paste in a glass jar or plastic container. Add the lime juice, orange juice, vinegar, and oil. Shake it up well to combine. Blend can be used as a marinade for chicken, beef or as a table condiment. If you can't locate Pico De Gallo you can make it with this recipe. In a mixing bowl, combine all ingredients together. Toss thoroughly. Let sit for 15 minutes to 1 hour while flavors to blend.